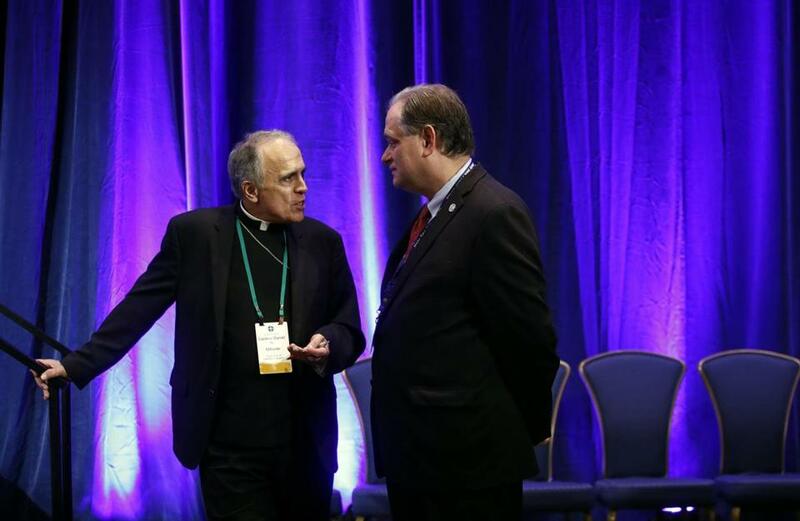 Cardinal Daniel DiNardo of the Archdiocese of Galveston-Houston, president of the United States Conference of Catholic Bishops, left, spoke with James Rogers, the conference’s chief communications officer Tuesday in Baltimore. BALTIMORE — Stung by the Vatican’s surprise demand to postpone a long-awaited bishop accountability policy, the nation’s Roman Catholic prelates listened in rapt silence Tuesday as the leader of their own advisory panel on sexual abuse assailed them for doing too little, too late. “The faithful and the clergy do not trust many of you. They are angry and frustrated, no longer satisfied with words and even with prayer,” said Francesco Cesareo, a layman who is the chairman of the National Review Board and president of Assumption College in Worcester. The unusual public scolding came on a day when more than 200 US bishops, still reeling from the Vatican’s sudden decision, unveiled the accountability proposals they had hoped to adopt this week. But instead of taking action, the bishops were left only with words: dismay at the postponement, determination to fix their problems, and even scattered grumblings about the role of civil authorities and the news media in training a spotlight on a church in trouble. “I was heartbroken that the Holy See does not trust us. What are we doing to have that kind of reaction?” said Bishop Shawn McKnight of Jefferson City, Mo. Channeling the outrage of Catholics in the pews, Cesareo excoriated the fathers of the US church for the pace and power of their reforms. In blunt, unsparing terms, he told the bishops to search their archives and files and publicize all credible cases of sexual abuse of minors and adults since at least 1950. Cesareo was named chairman of the National Review Board in 2013; he also was tapped earlier this year by Boston Cardinal Sean P. O’Malley to assist in investigating alleged misconduct at St. John’s Seminary in Brighton. The National Review Board was established in 2002 to assist and monitor the bishops’ implementation of new rules protecting children from sexual abuse by clergy and other church personnel. Cesareo said that the “horrific abuse” reported by a Pennsylvania grand jury this summer — 1,000 children abused by 300 priests over 70 years — does not reflect the US dioceses of today. But he urged the bishops to swiftly address the major gaps that remain. Cesareo said he regretted they would not be voting this week to strengthen accountability. “You must put the victims first when allegations come forward. How many souls have been lost because of this crisis?” Cesareo said. On Monday, the conference opened with a stunning announcement that the Vatican had asked the bishops to postpone voting on accountability. The church has still not fully explained the request. Despite the delay, Cesareo urged the prelates not to lose focus, even though new standards for bishops now might not be adopted until late 2019 or later. The Vatican asked that the voting be delayed past February, when bishops from around the globe will meet in Rome to discuss the crisis. Many prelates here urged Cardinal Daniel DiNardo of Galveston-Houston, president of the conference, to bring an acute sense of urgency to that session. He said his strong remarks were intended as “a frank perspective of what the laity is thinking.” The board members decided that “we needed to be strong, we needed to be concrete, and we needed to get them to think,” Cesareo said. With one day of meetings remaining in Baltimore, the Vatican’s decision has robbed the gathering — the first since the Pennsylvania grand jury report and abuse-related resignation of Cardinal Theodore McCarrick this summer — of much of the momentum many of the bishops had expected. The proposed reforms, released publicly Tuesday, would hold bishops to explicit standards of conduct related to sexual abuse and misconduct; form a commission of lay people and clergy to investigate violations of those standards; and create an independent, third-party system to collect complaints against bishops. The language in the draft proposals acknowledges that oversight is inadequate. For the first time, US bishops would have standards meant explicitly for them, as well as a system to report negligent and criminal bishops to civil authorities and the pope, who under church law has the sole power to remove them. 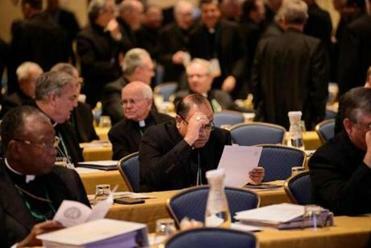 During a landmark 2002 meeting in Dallas, which followed the explosion of the sexual-abuse crisis in Boston, the bishops exempted themselves from the new guidelines they adopted for priests. Complaints about a bishop would be investigated by a special commission of six lay members and three clergy, who would submit a report to the pope’s envoy to the United States and ask that he bring the findings to the Vatican. Any criminal complaints against the bishops — for whom “there can be no ‘double life,’ no ‘special circumstances,’ no ‘secret life,’ ” the proposals said — would be relayed to civil authorities for possible prosecution. O’Malley, the archbishop of Boston and the top adviser to Pope Francis on sexual abuse, told the gathering that a lack of transparency and follow-through by even one bishop can harm the church’s overall credibility. “When mistakes are made in one diocese of the country, it affects all of us,” O’Malley said. In an interview, the cardinal stressed that American bishops need to work harder to adhere to the policies they endorsed 16 years ago in the Dallas Charter, including zero tolerance of sexual abuse. “I think there are bishops who have not followed the charter. They should present themselves and resign,” O’Malley said. Among the bishops here, however, a recurring sentiment was that the church has made progress since 2002 in curbing sexual abuse and owning up to its mistakes.